Captain Sig Hansen has been fishing crabs in Alaska aboard the F/V Northwestern for more than 30 years. In 2005, Discovery Channel aired the documentary TV show "Deadliest Catch", which portrays real life aboard fishing vessels in the Bering Sea. Since then, he has been one of the most charismatic characters of the globally watched TV show. In April 2018, PALFINGER MARINE received a purchase order from Captain Hansen for a knuckle boom crane (PKM 250) to be used for lifting operations on the iconic crab fishing boat F/V Northwestern. This order marks the first PALFINGER MARINE crane dedicated to the Alaskan crab fisheries and comes two years after Brian Jacob started his new position as Business Development Manager for the North American fishing industry in Seattle. His mechanical engineering background led him to spend time on various fishing boats, analyzing the conditions and proposing PALFINGER MARINE's cranes to customers. Cranes are extremely important on crab fishing boats. They are used intensively in rough seas. 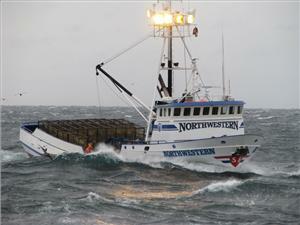 The F/V Northwestern can carry up to 250 pots, which are handled by the crane day and night with very few interruptions. The super-low weight of was one of the main selling arguments for the PALFINGER MARINE knuckle boom crane. The lighter the crane, the more stable the ship is, which means that the ship is both safer and more efficient. "I am very proud that Captain Sig Hansen and his crew trusted us as a crane supplier for the F/V Northwestern, and I just cannot wait to see our crane aboard. It proves that PALFINGER MARINE is recognized for its high-quality and reliable products," Jacob said. Delivery of the crane to Dutch Harbor is planned by the end of 2018. From there, it will head straight to the opilio and bairdi crab seasons.